We present a real pearl among the most beautiful houses of Tenerife. 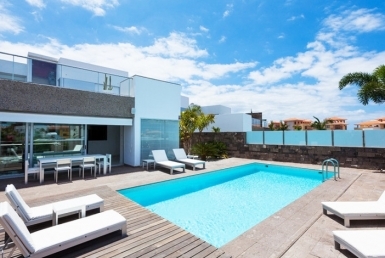 This villa is located in a very prestigious area of ​​Golf Costa Adeje. Occupies a beautifully located plot of 1072 square meters. This unique location guarantees panoramic views of the ocean, the golf course and the mountains. The house has three levels. In the basement there is a large garage for several cars. Next, there is a bedroom with private bathroom, a kitchen with laundry room, a games room, a wine cellar and a sauna. There are stairs and a comfortable elevator that leads to the following floors. On the main floor you will find a corridor, a toilet, a spacious and well equipped kitchen, and a large living room with wonderful views of the garden. Upstairs, there are three bedrooms with private bathrooms and terraces. The villa is well equipped and furnished, finished with materials of the highest quality and it´s kept in a modern and cozy style. Numerous glazing provides a lot of light in all the rooms and allow you to enjoy the wonderful views of the surroundings from every corner of the house. Outside you will find a beautiful garden, perfectly arranged. It has several relaxation areas with sofas and sun loungers. Undoubtedly, the most important point of the garden is a jacuzzi and a large pool. The magnificent location of the villa guarantees life in a quiet and prestigious neighborhood. Do not hesitate to contact us and visit this impressive property.